Is more government aid needed? Millions of families who once enjoyed the American dream of home ownership and upward financial mobility are sliding down the economic ladder — some into poverty. 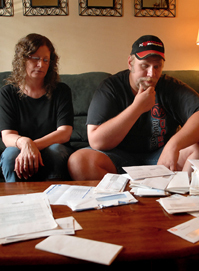 Many have been forced to seek government help for the first time. The plunging fortunes of working families are pushing the U.S. economy deeper into recession as plummeting demand for goods and services creates a downward economic spiral. A consumption binge and growing consumer debt beginning in the 1990s contributed to the middle-class squeeze, but the bigger culprits were exploding prices for necessities such as housing, medical care and college tuition, cuts in employer-funded benefits and, some say, government policies that favored the wealthy. President Barack Obama has promised major aid for the middle class, and some economists are calling for new programs — most notably national health coverage — to assist working Americans.